After clinching her maiden Commonwealth Games medal, five-time world champion M.C. 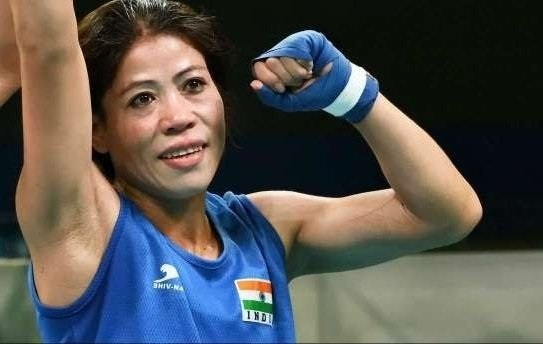 Mary Kom says she took the Gold Coast Games as a challenge and has urged other athletes to “flush out” the age factor. Mary, 35, clinched the gold in Light Flyweight (48kg) category in Gold Coast, defeating Kristina O’Hara of Northern Ireland in the final. “I never spoke about retirement, these are all rumours. My focus is now solely on that elusive Olympic gold. Whether I win or not is a separate thing but I am working hard to achieve that goal,” Mary said putting a lid on all talks of her retirement, reiterating that she will continue boxing till her body allows her. “Age has never been a factor for me, lets flush this ‘age factor’ out of our minds. I will continue boxing till my body allows me,” she said. Kom conceded she had a busy schedule — as a professional athlete, parent, gym owner and lawmaker — but sounded a warning to her opponents against assuming she had too much on her plate. “I took the CWG as a challenge and emerged successful since I have always prioritised my training. With this medal I believe I have succeeded in silencing many of my critics. I can challenge anyone when I am on top of my training,” she added. Asked about her chances in the upcoming Asian Games in Jakarta in August, the London Olympics bronze medallist conceded that the Asiad is a tougher tournament, considering the fact that she will have to compete in a higher weight category. Mary, a Rajya Sabha MP, will have to compete in the Flyweight (51kg) category at the Asiad, since the 48kg division is not a part of the Asian Games and the Olympics. “The Asian Games will be a bigger challenge, where I will have to compete in a higher weight category. So whatever the category is, I have to be fully ready and focussed on my training,” she said. Mary, who has been competing non-stop for the past five months, starting with the Asian Championships gold in November, has no plans of taking a break. Ahead of the CWG, Mary won a gold medal in the India Open in January before settling for a silver in the Strandja Memorial in Bulgaria in February. When asked about the quality of India’s coaching staff, Mary was quick to pick women’s High-Performance manager Raffaele Bergamasco and her personal coach Chhote Lal Yadav as a great combination. “Raffaele and Chhote Lal are very good coaches. Rafael is an experienced coach, Chhote Lal is young and can learn a lot from his company. If he continues in the same way, India will not require foreign coaches,” she said. Asked about India’s bench strength in women’s boxing, Mary sounded positive, and also credited the Boxing Federation of India (BFI) for the gradual rise of Indian boxers. “India has a rich bench strength in women’s boxing. I have seen a lot of young boxers coming up, thanks to BFI’s efforts of introducing new tournaments like the India Open boxing and also raising their hands in hosting international tournaments like the women’s Youth World Championships,” she said. “Lovleena (Borgohain) is a very talented and promising boxer but unfortunately missed the medal (in 69kg category). But I do hope she keeps training hard and not lose focus. Medals will definitely come to her kitty one day,” she added. After returning with an impressive haul of nine medals from the CWG, the Indian boxing contingent will take a break for a few days before heading to the United States for physical training, while the second string side will participate in a tournament in Serbia.